Perfect for a 1800's period costume or theater! 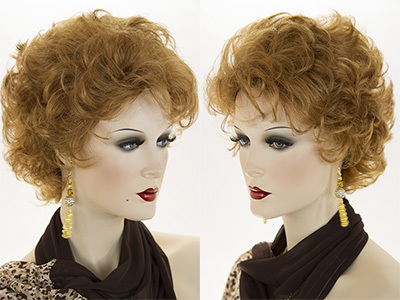 This stunning premium quality, mid-length wig, reminiscent of the ornate hairstyles of the past will complete your look. See item details for available colors. Glamorous wavy, mid length, layered shag style with a feathered back. Flattering for most face shapes. Looks especially slimming for round face shapes.The length falls to the shoulder. See item details for available colors. Striking mid length straight human hair wig. This lovely hairstyle has face framing graduated sides and back with bangs. Featuring, a 2 inch center skin part, for a completely natural appearance. The hair is approximately 16 inches from the top center skin part to the bottom length. See item details for available colors. Medium length, straight hair, with layers on the sides and ends. 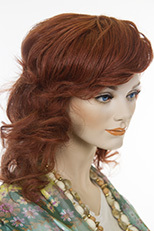 This lovely wig features a natural looking skin part. See item details for available colors. Modern, chic salon cut. 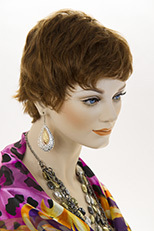 This striking short, straight wig, features a natural looking partial skin top. This feminine tapered bob has a long asymmetrical front, no bangs and an off centered part. See item details for available colors. Instantly change your look with this luxurious fall with wet look curls, 11 inches in length. The size of the base is 5 by 3.5 inches. See item details for available colors. Modern and youthful! 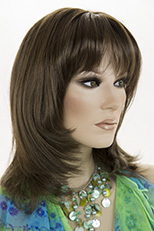 This mid length straight layered wig features soft bangs with a natural looking skin top part. This elegant yet modern hairstyle flatters most face shapes. See item details for available colors. look is short, sleek and super comfortable. Soft layers for versatile styling and O'solite construction make this wig perfect for all-day, everyday wear. 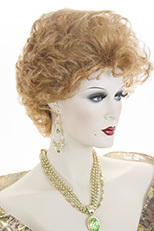 Cathy, a glamorous, wavy, curly, short layered wig with a natural looking skin top! Perfect for street wear as well as theater use. stunning shades of blonde, red, brown and black. See item details for available colors. Medium length, soft wavy, page style wig, with natural looking lace front. Featuring heat friendly fiber, which gives the look and feel of human hair with styling many options. The length is approximately 17 inches. Mid length straight layered bob style wig. This chic chin length wet look bob has a left side part and layers. Perfect for any occasion! See item details for available colors. Feminine, youthful,modern, long, wavy, straight, heat ok, natural looking wig, with long side swept bangs. The hair is 23 inches in length. See item details for available colors. Please allow one week for special order colors. Youthful, arty, medium length, long, wavy human hair blend wig, which is 18 to 21 inches long. The hair is made 50/50 from the finest human hair, with the next generation of heat friendly futura Kanekalon fiber. Futura by Kanekalon enables you to re-style and change your look effortlessly. Curl, flat iron, blow dry and re-style again and again. Futura’s breakthrough high heat resistance technology can safely handle temps up to 377°. See item details for available colors. Please allow ten days for special order colors. Braided headband, past the shoulder page with a slight wave at the ends. The hair is 16 inches long. See item details for available colors. Ultra premium quality wig! Light Weight Luxurious layered waves frame your face! 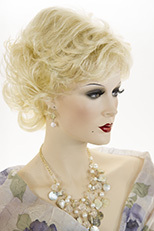 This lovely updated mid length style exudes glamour from the past. See item details for available colors.